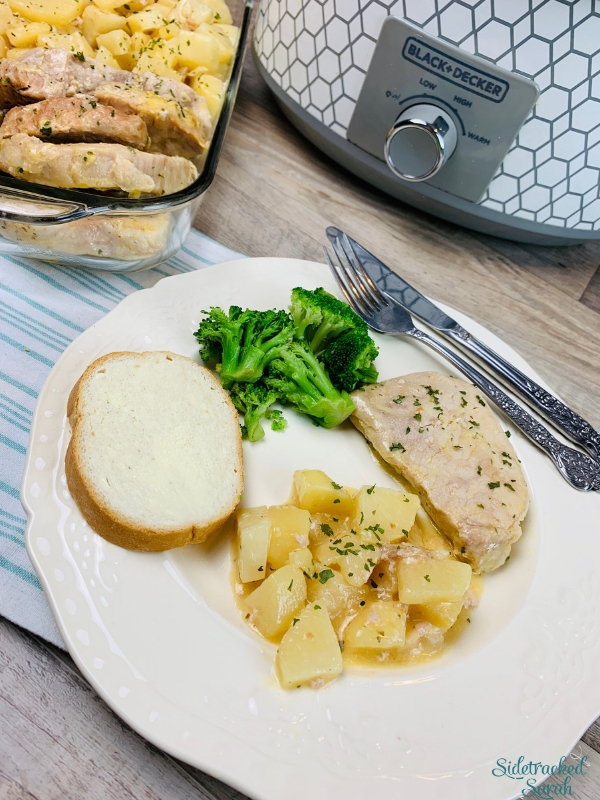 Slow Cooker Pork Chops & Potatoes is a delicious, hearty, and easy meal your family will adore! The creamy sauce and savory flavors will make it an instant family favorite. We love Slow Cooker Pork recipes! 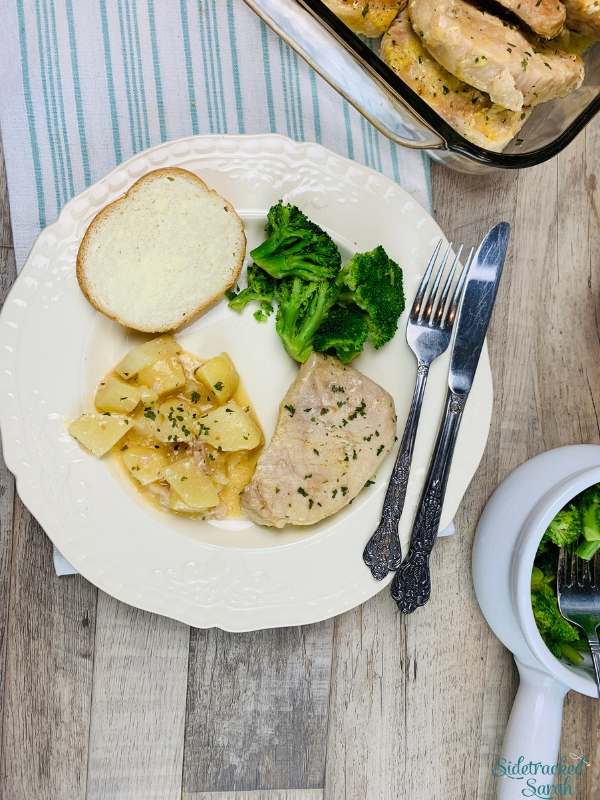 Some of our favorites include Crockpot Scalloped Potatoes with Ham and Delicious Slow Cooker Beer Brats. We love pork chops, but it can be so difficult to get them “just right” on the stove or in the oven. If you cook them just a bit too long or at too high of heat, they tend to get dry. That’s where the magic of the slow cooker comes in! The low heat and slow cooking method works wonders for these pork chops, and the potatoes cook right along with them. The end result is so good! DOES IT MATTER WHAT CUT OF PORK CHOPS I USE? Because pork chops tend to have little fat, it’s easy for them to dry out. The slow cooker helps quite a bit with this, but I really do recommend using thick cut pork chops. The extra thickness of the cut does wonders in this recipe! 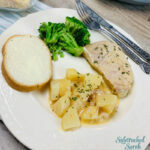 WHAT SHOULD I SERVE WITH SLOW COOKER PORK CHOPS & POTATOES? The only thing you really need to make along with this dish is a simple vegetable! The savory pork chops, tender potatoes, and creamy sauce make for a delicious dish all on their own. Round it out with some steamed veggies or a quick salad, and you’re all set! 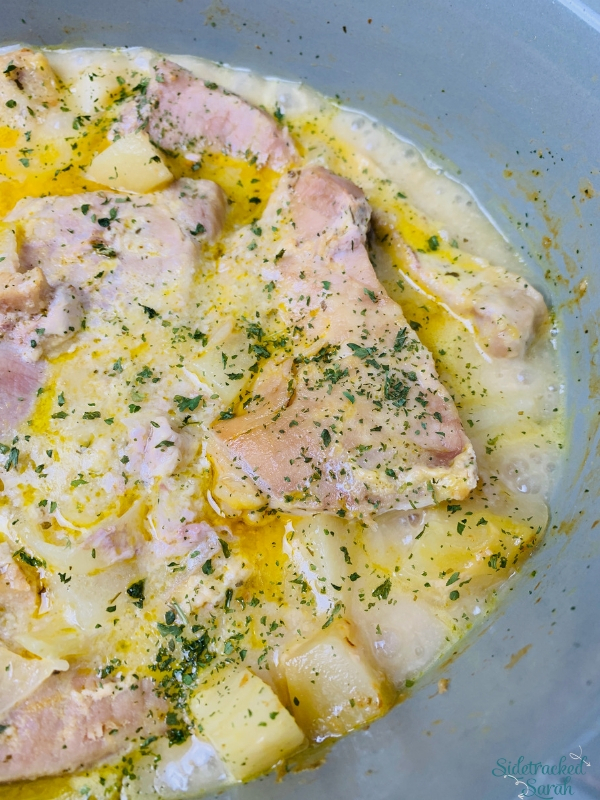 WILL SLOW COOKER PORK CHOPS & POTATOES FREEZE WELL? You can freeze any leftover pork chops, but I don’t recommend freezing the sauce or the potatoes. The dairy in the sauce can tend to separate when it is frozen and thawed, and potatoes tend to take on an odd color and texture when frozen. However, I doubt you’ll have enough leftovers to freeze! My family always cleans their plates with this recipe, and if you do have any extras, they’ll keep well in the refrigerator for a few days. Just pull them out and enjoy a quick lunch or dinner! WANT MORE EASY SLOW COOKER PORK RECIPE IDEAS? Place chopped potatoes and onions on bottom of slow cooker. Place pork chops on top of them. Mix together cream of chicken soup, ranch dressing mix and milk. Pour over the top of the pork chops and potatoes. Use the extra sauce that it was cooked in, as gravy to pour over the Pork Chops and potatoes if desired and sprinkle with dried parsley.